Trump Threatens To "Terminate NAFTA Entirely" - Joe.My.God. 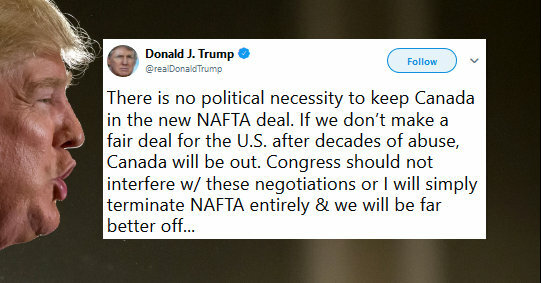 President Trump on Saturday threatened to exclude Canada from a new NAFTA deal and “terminate” the trade pact entirely if Congress gets involved in negotiations. He went on to warn Congress, which has authority over trade agreements, “not to interfere” or he will scrap NAFTA altogether. Under NAFTA rules, Trump can withdraw the U.S. from the pact if he gives six months’ notice, but legal experts say Congress can and likely would put up legal obstacles to block the move.